Djinn (sing. "djinni," fem. sing. "djinnia"; also spelled "jinn" and "jinni") are also called daimons, rakshasas, peries, and mazzikim, and Anglicized as "genies." 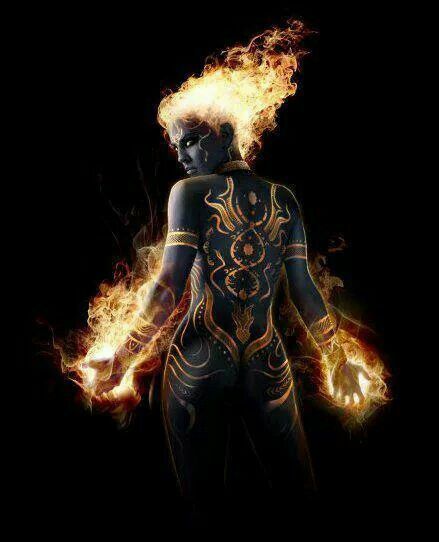 Djinn are a race of creatures "made of smokeless fire." In modern terms, they are made of plasma, ionized gas. They are native to the ionosphere, also called "the Sphere of Fire" and "the Empyrean." 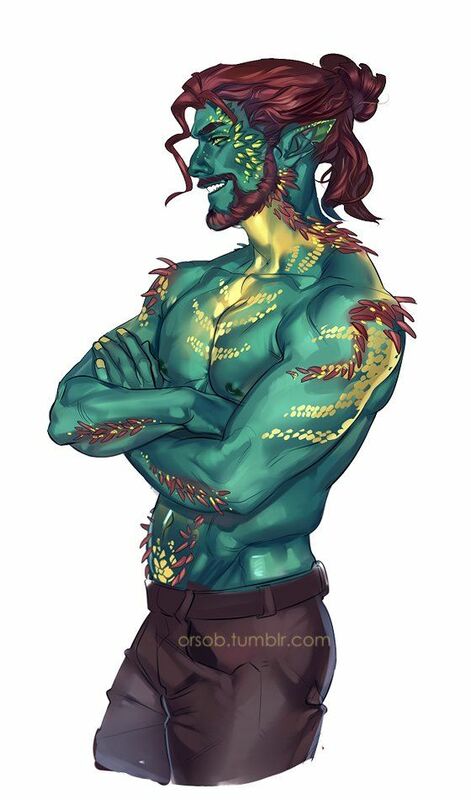 They are somewhat older than humans and intensely magical, the most magically potent of Earthly races. Physically, a djinni consists of a prolate spheroid of plasma, about the size of a car, massing a few micrograms. The spheroid is divided into seven concentric shells, each open at one end, except for the inmost, which is not hollow. The shells spin, in alternating directions: if the outermost is clockwise, the next one in is counter-clockwise, and so on. A rough characterization of a djinni is whether it is male or female, deosil or widdershins, and red, yellow (or "gold"), green, blue, or violet (or "black"). The car-sized prolate description only applies to an average djinni in its rest state. They vary enormously in size and power level, and an individual is highly variable in physical shape. Djinn easily extend their shapes in amoeboid ways, and often assume a conical or cylindrical shape like a whirlwind. 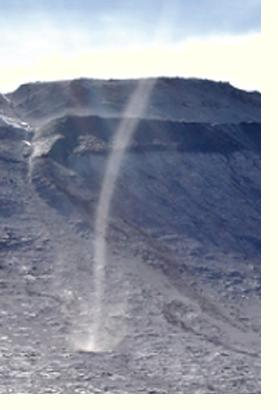 The whirlwind shape is very common when they are down in the atmosphere. On top of that, they are natural shapeshifters. Djinn share the Empyrean with the jann, sub-sapient animals of the same plasmonic nature and similar magical power. In fact, that is about all there is in the Empyrean. It is similar to a coral reef, where everything is alive, even the "rocks," and everything you encounter has a potential ecological relationship to you, for example as diner or dinner. Primitive djinn spent a lot of energy hunting, fighting, and taming jann. A few micrograms of hot gas is not enough for an intelligent brain. Djinn are much more heavily magical than humans because they could not be alive or intelligent at all by relying on matter as much as we do. They are mostly spirit and, just as humans have a metaphysical craving for the spirit world, djinn have a craving for the material world. Thus they are always curious about, and yearning for, the surface world, down there. This is in tension with a reverse yearning for the Emyprean, where they are most comfortable and can hunt for food. Basic djinnish magic only allows a djinni to reach the surface briefly and occasionally. Much magical technology has gone into learning to "colonize" the surface, largely centering on advanced shapeshifting, into shapes that can endure surface conditions. However, if a djinni takes a shape that can stay indefinitely on the surface, its magical power begins to decline after too long away from the Empyrean; eventually, it will be unable to ascend and is stuck barring outside help. The djinn arose a few millennia before Adam and were given Stewardship of the Earth. They explored and made settlements on the surface. During this time, they expanded their shapeshifting powers, learning to copy animal forms by tapping into the magic of the Animal Powers. Then also contacted the fays and taught them advanced shapeshifting. However, they fell into a long series of savage wars among themselves, embroiling the eldila, Animal Powers, and early fays. Prophets appeared among the djinn, warning them that their Stewardship was in danger. Note: Djinn are even more prone to faction than humans are. Because of their shapeshifting power, and because they can use geases and binding oaths in lieu of law enforcement, there is not so much distinction between an ideology, a nation, a race, or a subspecies as with humans. More than with us, their beliefs affect their forms and natures. When Adam and Eve were created, the Stewardship passed to them. Djinnish prophets announced this, and the djinn found that their nymic magic and their ability to dominate jann were suddenly impaired. along with other symptoms humans never heard of. Many djinn, led by Iblis, were infuriated and sided with Hell. 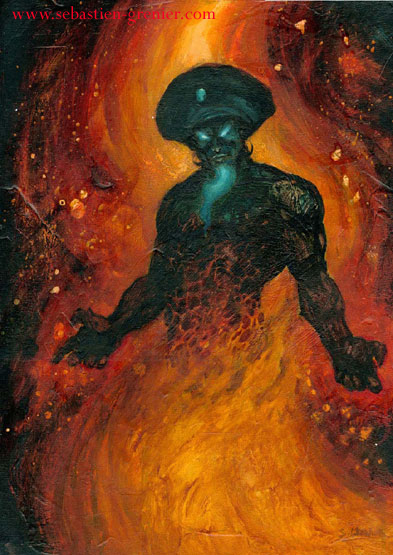 Most jinn, though, were impressed with Adamite powers of matter-magic and the nymic magic now lost to djinn, and the ability to astrally project to the Empyrean. Some djinn became a worshipping servant-race to antediluvian humans. Some of these hoped to make collective contrition and to win back their Stewardship, or at least a partnered Stewardship with humans. Most were of the hostile-and-envious persuasion, without necessarily going infernal. 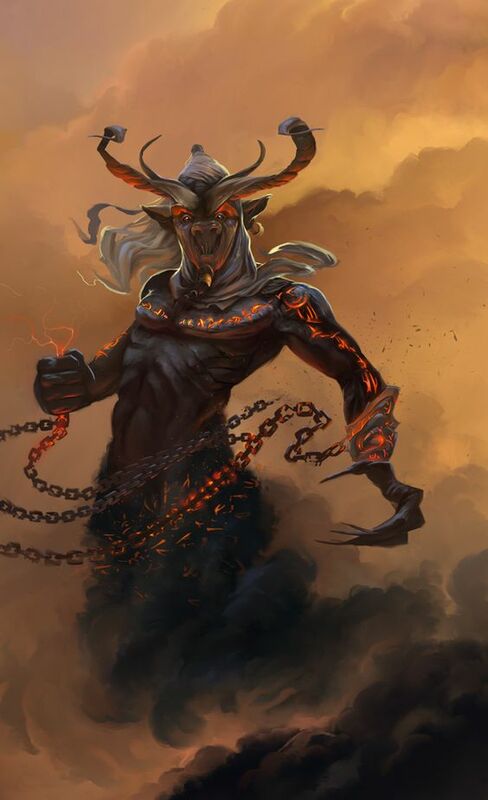 After the Stewardship was lost, Heaven sent the Grigori, a band of adhene seeking to work out their redemption, to breed with the djinn and raise up angel-djinn hybrids, the dhenanonim, often called "the old gods." The dhenanomim were then given ka'u of the Powers (godheads) wherewith to work. They are the basis for the myths of the Indo-European pantheons. The Flood put an end to human-worship among djinn as a significant movement. Human magic never recovered its antediluvian level, and the former worshippers and servants resented their old masters. Then, the surviving Adamite mage-kings organized under Nimrod and tried to storm the Empyrean in a mass astral projection from the Tower of Babel. They were smacked down by God Himself and human magic took another permanent hit, but the attempt was frightening enough that, ever since, djinn have viewed humans warily. Whenever djinn had power over humans (i.e., before the Sundered Era), the default view was that humans had to be controlled. The old gods brought a golden age to the djinn for a while. They remodeled the djinn themselves, making surface-dwelling easier, extending shapeshifting beyond copying animal species, advancing ka-based magic such as pallia and wishes, making teleportation common and far-reaching. Few un-amended djinn are left. After the Postdiluvian and Valinorean Eras, djinn returned to the surface in force during the Old Gods' Era. Humans were either left to themselves, as hunter-gatherers with crumbs of magic, or kept as servant castes in djinn-dominated communities. The golden age ended with the Typhonomachy, around the time that recorded history begins. The old gods took lethal harm and began to die out, though it took centuries. The djinn withdrew from the surface again, except for isolated individuals and small groups. Some of these small groups were the basis for some local pantheons of the Hyperborean Age and the Sundered Era. This is where matters now stand, with djinn rare on the Earth's surface, hidden far behind the Sundering. Djinnistan, "Genie-land," is not just the Empyrean, the Sphere of Fire, the ionosphere, though this is certainly the djinnish heartland. The djinn also have extradimensional territories, reached through gateways opened up in the Sphere of Fire. Some are humanly habitable; some are not. They also used to have mobile territories, "flying mountains," perhaps derived from captured asteroids, deeply enchanted and animated by bound jann. These were the Mountains of Kâf. They no longer fly. Many were unruly, which is not something you want to tolerate in a flying mountain, and were grounded. Any others were grounded as the old gods faded and magic supplies dried up. Most or all were grounded in the extradimensional zones off base Earth. As already mentioned, djinn are adept at shapeshifting, and include invisibility and impalpability in this. So they can really look like almost anything. In shapeshifting, the djinni must learn each new shape independently, like a musician learning a new composition. Unless a djinni is particularly devoted to the craft of shapeshifting, it will have a small repertoire of useful shapes that it sticks to, with simple variations. If a djinni makes a thorough shapeshift and not just a seeming (which is harder to control and lapses without continuous attention), it takes on the complete physical character of the shape. Thus a djinni in human shape is human as far as any medical examination can determine. That is how djinn can interbreed with organic life. Djinn exhibit "morphic inertia" in their various shapes. The longer they stay in any shape other than their native one, the harder it is for them to change shape. A djinni that has spent years as an animated stone giant, for instance, will need a few days before they can shake off that shape for another. Smashing the stone figure would overcome the inertia at once, but the djinni would be very likely to die of the blow. Of Earthly races, only djinn are capable of true teleportation, transfer from one point to another instantaneously without movement through the intervening space. For an experienced teleporter in good condition, distance is no object within the intercontinental range. Teleporting to the Moon is another matter; anyway, it's a war zone out there. Taking cargo increases the effort and, for a given effort, reduces the range. Yes, some djinn can teleport a castle from China to Arabia, but not many and not often. Sending cargo without going yourself is certainly possible, but a more advanced feat. Pulling cargo in is trickier still. To teleport to any location, the teleporter must have it in sense-shot or have tagged it in some psychic way. These tags are fairly easy to detect, block, or destroy, all of which limits teleportation. If there is a solid object in the way at the destination, the arriving teleporter (or teleportee) and the object both take damage. If the object weighs more than about a quarter of the payload, the teleport fails (though both still take damage). If the object is smaller, the teleport succeeds and the small object goes flying off in a random direction. Moving across dimensions to other zones is possible for advanced teleporters under the proper conditions. Besides shapeshifting and teleporting, djinn are capable of glamour and seemings, and are very fast, capable of flying at jet speeds. They are also very powerful physically, having the strength of a few multiples to a few hundred men, depending on the particular djinni. All djinn are capable of spirit sight, and can see ghosts, angels, etc., under normal conditions (that is, unless the ghost hides or the angel chooses not to be seen). Spirit sight entails being able to see in the dark and, when one thinks to do so, through walls. 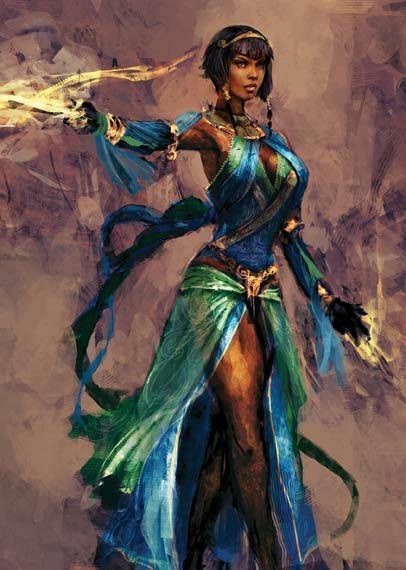 Djinn are capable of learning any form of magic that humans or fays can employ. Both physical and magical power levels vary wildly among djinn, the more powerful being rarer. Djinn come in male and female sexes. A female is called a djinnia. Conception, gestation, and birth all happen within a few seconds. Infant djinn reach physical maturity as fast as resources come their way. And, as mentioned before, djinn are highly variable in power, so there is a good chance that the infant will quickly become as powerful as its parents or other immediate family while still infantile in mentality. (Mental maturity takes seven to fifty years—again, highly variable.) As a result, it is normal for the infant djinni to be put under geas by its family immediately. The natural djinnish lifespan, like their power level, ranges widely, from a proverbial seven times to seventy times human, or 500 to 5000 years, but it can be extended magically. The longer lifespans are rarer, and there is no guarantee they will not be cut short by violence. Djinni-on-djinni violence and magical attack, along with attack by jann, are the commonest ways that djinn meet early death. When shapeshifted into a fully human form, djinn can interbreed with humans. The same applies to any other species they temporarily but completely adopt. Many djinn have some human in them, a legacy of the pre-Sundered eras. Hybrids born to human mothers are called mugharabun or lilites, and are humans with a strong whiff of djinnish magic about them. There are several clans or races of these and new ones could arise at any time. For more on lilites, see Spiritual Strains. The hybrids born to djinnish mothers are called peries, mazzikim, or lilim and are djinn with tendencies to human psychology and shape. Lilim proper are descended from the first lilim, children of Adam and the djinnia Lilith, but the name is spread around carelessly by humans. The masculine singular is lilu; the feminine singular is lili. Lilim, like all djinn, are shapeshifters, but they have two default forms. One is the standard djinnish fire-egg; the other is an ectoplasmic human form, a humanoid aeriel body, like that of a ka or ghost. Their human form often has exotic features, like blue or green skin, or glowing eyes, though it is hard to tell if such details are really part of the default form unless you know the individual well; they can tweak such things easily. Lilim, like lilites and like other djinn, are divided into many tribes and clans. Many of these have bad reputations. The stereotype of "bad lilim" is sly, seductive, and predatory. The stereotype of "good lilim" is elusive, daintily pretty, and gentle. When confronting a pure-blood djinni, a human may feel they are faced with something like a tornado or an unexploded bomb; when confronted with a lilu, a human may feel they are confronted with a maze or dark forest of unknown safety. Lilim have less raw magical and physical power than most djinn, and perhaps because of that often make a greater study of subtler magics. They are especially known for glamour and for innovative ways of generating and storing prana. With malign lilim, "generating" includes "stealing" by psychic vampirism, or simply by con games and cheats where the stakes include prana. Benign lilim often use artistic forms of thematic magic to generate extra prana. 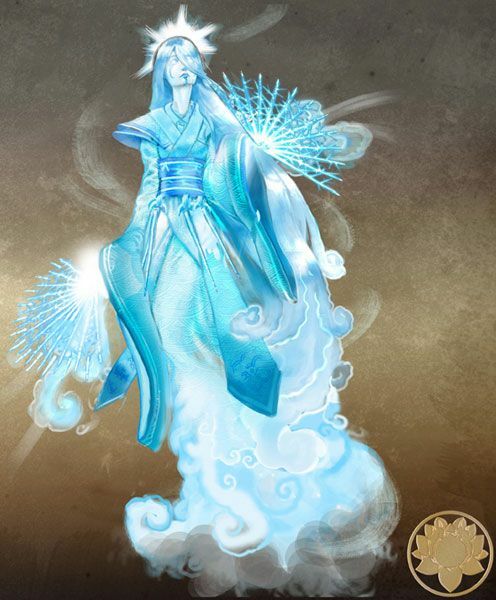 Few lilim use austerities to generate more prana; they feel they are already too weak. Also spelled efreet, ifreet, afrit, or afreet. These are the most powerful class of djinn. They are to djinn what nephilim are to humans, being as much as half eldil by "blood." The old gods were ifrits, though divinely sanctioned and given additional angelic powers. Any djinni can cast a ka. Most djinn can cast only three to five ka'u, with three being the commonest limit, but myth talks of magical prodigies casting armies, and more reliable legend records twelve or fourteen. For a djinni, its ka is a servant or guard or proxy, of course, but also a shadow-bearer, voicing or doing what the djinni dares not. Since djinn are more spiritual in nature than humans, there is less difference in state when they die. But there is a difference. At death, a djinni loses its material aspects, just as a human does; therefore, they lose all their great physical strength, their power to shapeshift, and the ability to cast and pull ka'u. They can cast intangible shapes and move things telekinetically, as a human ghost might, but only at a cost in prana and therefore not continuously. Death frees them from any oaths or geases cast on them by incarnate agents such as humans or other djinn, but oaths and geases cast on them by eldila or other powerful spirits remain in effect. They retain their True Names and can contract new oaths, but lose any power stored in their names and must begin anew. See "Oaths and Geases" and "True Names" below. The above powers usually do not matter, though, since the shock of death casts most djinn into the oblivion of Sheol for a long time, or they are intercepted and taken away to an afterlife in Paradise, Hell, or an elysium, as humans are. Djinn only rarely become haunting ghosts or wandering spirits. See The Afterlife. Djinn in service to Heaven may actually become angels when they die – not eldila, but immortal versions of their old selves, confirmed in grace, djinnish saints. Contrariwise, infernal djinn are tempted with the offer of apodemonosis, but this is a trap. Djinnish society is a network of oaths and geases, which largely takes the place of law and custom. The primary obligation is to family. Next comes marriage oaths, which take a wide variety of forms. After that, come oaths of loyalty to various wider societies, most commonly to ideological groups, but occasionally to feudal hierarchies. Then come various contractual oaths of essentially economic nature. Djinn attached to lamps or rings or the like are attached by a geas. The penalty for violating an oath or geas is generally loss of magical and physical power to some degree, up to fatality. A very widespread oath system is the use of True Names. At birth, the djinni is given a secret True Name. It can then oathbind itself by promising "I swear by my Name." Those who know the djinni's True Name can, at the very least, attract its attention by using the Name in a formal summons and may be able to bind the djinni unilaterally if they have the right magical powers. This system has even been adopted by humans and fays in many times and places, and within humans' and fays' more limited magical powers. See also Nymic Magic. Thanks to living in a war zone since their creation, djinn usually have one of three stances toward eldila: aligned with Heaven, aligned with Hell, or terrified of both. Individuals and groups do change alignments all the time, but these are major events in the careers of those parties. Those aligned with Heaven or Hell can expect to be called on by bright or dark eldila for services or may even live in a court or entourage attached to a particular angel or group of angels. (Such a life is best visualized by humans in metaphorical and allegorical terms. We are talking about animated electricity working for intelligent quanta of primordial energy, after all.) In return, their patrons give these djinn some amount of protection, and unaligned djinn give them some amount of fearful respect. Infernal djinn also receive perks like slaves of various species and such luxuries and wealth as djinn value. Celestial djinn are expected to work on the principle of virtue being its own reward, but at least their masters don't shred them or eat them if they fail. The celestial and infernal factions are roughly equal in size. The unaligned are a slight majority of all djinn. However, these three factions are not distributed uniformly over the world. There are good, bad, neutral, and battlefield patches, and they shift. All djinn are mixtures of good and evil, like humans, unless they are very far gone in the service of either Heaven or Hell. Those trying to be good come in all the same religions as humans, plus some unique to themselves. These include unaligned djinn, who are not necessarily ethically neutral—just scared of eldila. There are even "atheist" djinn, though these are really more like deists, believing God or the Absolute or Whatnot exists, but that it has no relevance to their lives. Unaligned djinn, if they worship, may worship God alone and still shun eldila, or they may worship gods of their own choosing. Usually, pagan djinn worship some real object – unlike human polytheists, whose object is most often a legend based only dimly on some spiritual reality. The objects of pagan djinnish worship are most often ancestors. Some worship elementals, or Valar or Maiar (whom they do not classify as eldila). At present, djinn have very limited open contact with humans because of the Sundering and eldilic pressures, which may be the same thing. The bright eldila protect humans from djinnish exploitation or even well-meant over-interference. The dark eldila do not want humans in many cultures to have ready proof of the supernatural. So djinn walk very secretly among humans. It was very different, back before the Sundered Era, especially during the Old Gods' Era. In That Hideous Strength, Merlin denies the old tale that he was "the son of one of the Airish Men," and Dimble remarks that "He's 'the devil's son'; but then Layamon goes out of his way to tell you that the kind of being who fathered Merlin needn't have been bad after all. You remember, 'There dwell in the sky many kinds of wights. Some of them are good, and some work evil'." So, though Merlin denies it, he was rumored to be the son of a spirit, and possibly a good spirit. But no one ever accused Merlin of being the son of an angel. So this could be taken as a very obscure reference to djinn. Rumor said that Merlin was, in our terminology, a lilite; he denied it. In The Lord of the Rings, "The Fellowship of the Ring," the Barrow Wights could have been dark djinn, reminiscent of the Arabian ghül, a degenerate djinni that haunts graveyards and eats corpses. Later, in "The Two Towers," the evil stone Watchers in the Tower of Cirith Ungol could have been djinn bound in those stony forms. In The Hobbit, "stone giants" toss boulders around for a game, during a thunderstorm in the Misty Mountains. This is the only reference to them. They could have been djinn. In Williams' Many Dimensions, one of the characters has a vision of Solomon's court, in which creatures that are almost certainly meant for djinn appear among men, birds, and beasts. In Williams' The Greater Trumps, we learn that there are "lords" ruling over the suits of the Tarot deck, and the Lords of Staves appear obscurely in a snowstorm to beat up a human character. It is possible that these are djinn – more likely than that they are angels. Before it was given as the name of the great Hebrew king, "Solomon" was the family name of a great house of djinn in the Mid-East. Several ifrits from this family set up as gods in Egypt and Mesopotamia, after aquiring eldilic ka'u. The djinnish house of Melchizedek is not so old or so powerful as the house of Solomon, but it is the custodian of the oldest monotheistic religion still practiced among djinn, and it supplied the king who blessed Abraham (Genesis 14:18). The family still resides in Jerusalem. He was once so great among the djinn, he was ranked with the angels and had minor angels in his retinue. He has not a trace of human ancestry and is proud of his pre-human antiquity. He was offended when, at the creation of Adam, he was told Adam and Eve would have dominion and theirs be the ruling race of Earth. He turned traitor and joined the forces of Hell, where he again rose to great power, being the peer of Beelzebub and the other infernal dukes. Iblis is the Devil's personal steward, and when the Bent One secludes himself—which he does fairly often, since his soul is a chewed-out sock-puppet for the use of Satan, and he can do little more than lick his wounds when the hand is withdrawn—Iblis is virtually in charge. It galls the great fallen eldila to be commanded by a mere djinni, but he has been delegated huge and horrible powers, and the dukes' main recourse is the threat of what the Bent One will think when he comes back. But Iblis does an excellent job of reflecting his master's evil will, so that threat is hollow. She is a mighty and ancient djinnia. She is now the "wife" of Samael. She wanted to be queen of all djinn. Ages ago, she made a deal with Samael: she feeds him and he gives her monsters and other minions to use for her ambitions. But she always wants more than he gives, just as he wants more than she can feed him; her empire is mostly a pyramid of succubi and vampires, sending her prana to power her battles and feed Samael's endless starvation. Lilith shares Iblis's resentment of humanity and makes a special practice of milking prana from infants, producing night-terrors and, sometimes, crib-death. This puts her and her lilim in a running battle with guardian angels. She was a djinnia who protected and propped up the USSR until her death in 1988. Her real name is unknown; she was known to esoteric Arabians as Zat al-Dawahi, "Mistress of Misfortunes," and referred to as Machikha Nash, "our stepmother," by the Soviet sunder guard, the Committee for Dialectical Extrapolation. She was magically poisonned when she ate the body of Kim Philby. (She was a gh�l.) Philby was shot with enchanted ammo in 1964 by Greenwood agent Andrew Hale to assassinate, not Philby, but the Stepmother. The Soviet Union quickly collapsed.